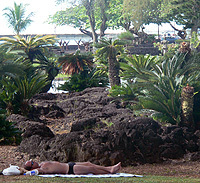 A sunbather enjoys the Hilo afternoon. Short bridges span the fishponds. 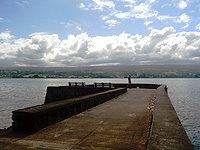 A short pier overlooks Hilo Bay. The park is popular with families. 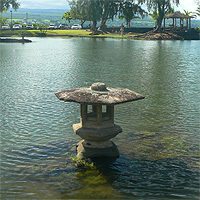 High tide may flood some paths. 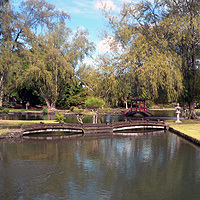 A stunning park and garden located on the bay of the Waiakea Peninsula, the Lili'uokalani Gardens provides 30 acres of well cared lawns, lazy ponds spanned by unusual and beautiful bridges, and many curving walkways that take you in and around this peaceful and beautiful park. 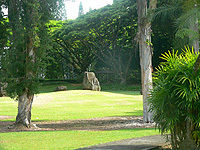 The gardens are located between downtown Hilo and the Airport, at the end of Banyan Road. 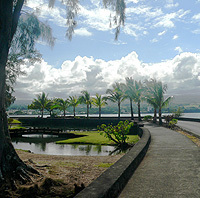 At the intersection of Kamehameha Road (which goes along Hilo bay front) and Highway 11 (which goes past the airport) turn makai (towards the ocean) onto Banyan drive. Take the drive past the golf course (on the left) and resorts (on the right) till just past the last resort where you will find the start of the gardens. The park has restrooms and a few small sheltered areas. There is drinking water at the park. 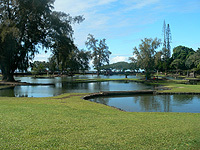 Swimming is available in the ocean and locals fish both in the garden ponds and the ocean. 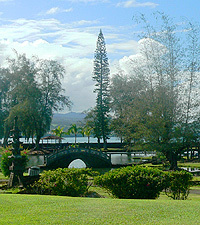 Queen Lili'uokalani Garden is located in the town of Hilo at sea level. 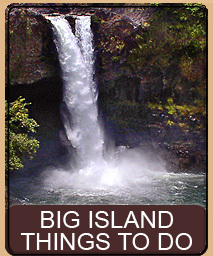 The weather, while tropical, may be rainy due to the nature of the Hilo area - so at the most all you might need is a small umbrella. 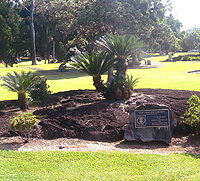 This beautiful and peaceful park in Hilo is dedicated to Queen Lydia Lili'uokalani - the greatly beloved and final Monarch of the Hawaiian islands. 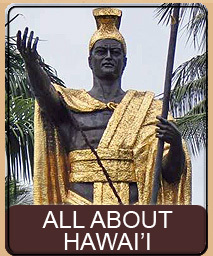 Queen Lili'uokalani ruled Hawai'i from January 17, 1891 until her illegal deposition on January 17, 1893 by American business, political, and military interests. 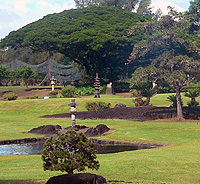 The 30 acre park grounds were donated by Queen Lili'uokalani for the purpose of creating this fantastic ornamental Japanese park which was built to honor the many hardworking Japanese immigrants who came to the Big Island to work the Waiakea Sugar Plantation. 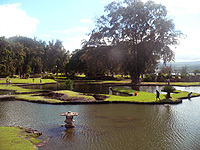 With over 30 acres this Yedo-style park is the largest true ornamental Japanese park outside of Japan, and is popular for tourists and locals alike. What you will experience while you wander the parks landscaping totally depends on which direction you entered the garden from. Since the garden is free and open year round, it has no fence or 'real' entrance and can be approached by all directions. 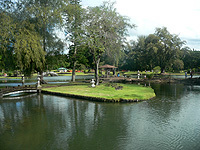 Many of the resorts are just a short walk from the garden and the park is only a mile or two from the airport and downtown Hilo, making it a quick and easy get-away for that perfect walk in the park or picnic lunch. 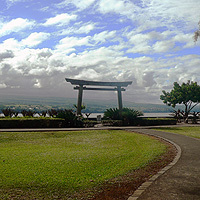 Because the park sits on Hilo bay facing east, it has a perfect view of the morning sun as it rises over the majestic Pacific Ocean. This makes it one of the nicest places to come to, just before sunrise. Before the sun comes up you can find locals flinging fishnets into the ocean just on the other side of the park, catching the early morning hungry fish. Since fishnets have changed little from the early Hawaiians, it is interesting to see how they stand, calm and very quiet, until just the right moment where a complex flick of the wrist sends the net spinning into the water. As the sun comes up you will find the park with many walkers and joggers, taking advantage of the cool morning trade winds and the beauty of the park at sunrise. Throughout the day, and often into the evenings, you can find families, couples, and those searching out a peaceful spot enjoying the various parts of the park. 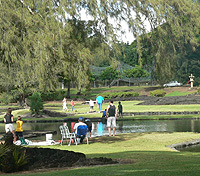 From a father and son playing catch, to tourists sunbathing, just about every activity is enjoyed in the park including fishing in the gently twisting fish ponds. 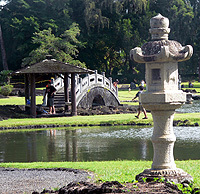 The park has various 'structures' including a traditional Japanese Tea House named Shoroan. The chashitsu (tea room) was donated by the Fifteenth Grand Tea Master of Urasenke, named (Grand Tea Master SoshitsuSen). This house is used for tea ceremonies and can be booked for various events. The Tea House was destroyed by fire in 1994 (reportedly at the hands of high schoolers) but was rebuilt and stands proudly today. 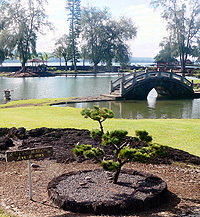 A Japanese rock garden has been recently added to the park and the paths, walkways, and drive around the park were recently redone and are in excellent condition. While you may find signs of construction 'here and there' around the gardens, an indication that it is constantly being improved, most of the pristine 30 acres are nearly perfect in every aspect. As you stroll across the lawn, or walk down one of the many paths, you will find yourself wandering in and around the various areas that are dotted by the fishponds. Paths will take you up ornate bridges and over fishponds, only to take you down and through a shallow part of a pond. 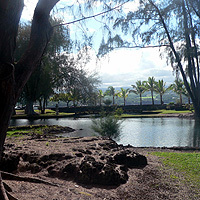 Because the park is at sea level, some of the fish ponds are open to the ocean through access beneath the road and this allows the tides to come up. Rising tides cause some of the paths to be watery, but this merely ads to the uniqueness and beauty of the area (this is a perfect place to wear rubbah slippahs or simply go barefoot). 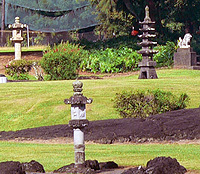 Stonework is everywhere as are also half-moon bridges, gazebos, small pagodas, Torii gates, and much more. 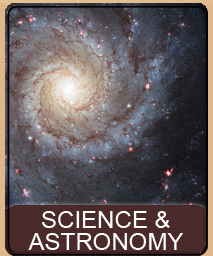 However, the layout is perfect allowing the eye plenty of time to enjoy and not be overwhelmed. 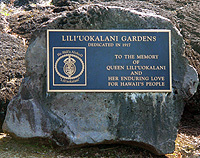 As you walk around the park you will encounter many small plaques and signs. Some of the signs are so faded you can barely make out the information, but most all are dedications of plants, and bonsai, and stonework. 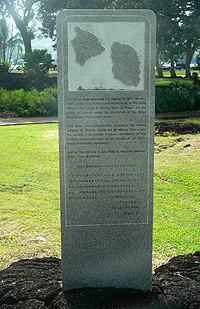 This stone commemorates the signing on 12th February, 1962 of the first Sister Island Relationship in the world between the island of Hawaii, State of Hawaii and the island of Oshima, under the jurisdiction of the Tokyo Metropolitan Government, Japan. 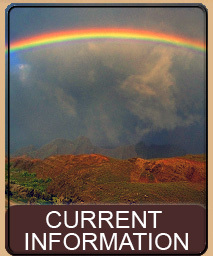 This Sister Island Relationship symbolizes the affinity between Mt. 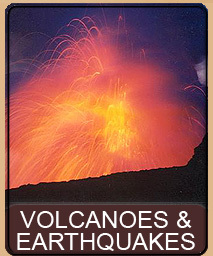 Kilauea, Hawaii and Mt. 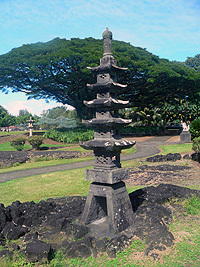 Mihara, Oshima and the peoples of the islands of Hawaii and Oshima on this thirtieth anniversary year of the signing of the Sister Island Relationship Agreement. Laid on this 18th day of July 1992 by Nagaharu Shimizu, Mayor Town of Oshima. 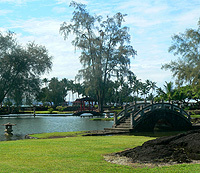 Other areas of the park include a sumo platform and a canoe shelter that holds Okinawan style canoes that are used for racing on special Okinawan race days. You will find a variety of plant life in the park, from beautiful flowering shrubs and plants to stately trees including the expansive banyan tree. Indeed, Banyan Drive, the road in front of the resorts, is lined with banyan trees that have each been planted by some famous person in history. A stroll past the trees will let you learn who planted each tree and when. Local plant life is also in abundance in the garden including many palms, bananas, hibiscus, and gingers. 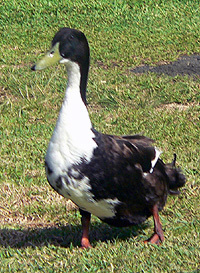 You can often find ducks and other water and ocean birds frequenting the ponds for a bite to eat or a quick bath - and the playful mongoose and noisy mynah birds are always plentiful. 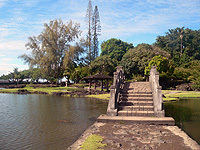 All in all, the gardens are a safe, free, and very beautiful and peaceful place to spend some time and enjoy Hilo weather. 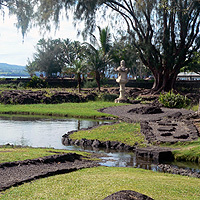 If you are lucky to be at the gardens during one of our clear and sunny days you will also have a splendid view of Mauna Kea, rising majestically behind downtown Hilo on the other side of the bay. 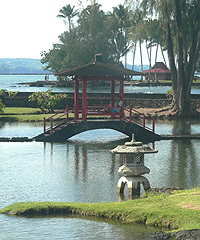 Do not miss the opportunity to visit, enjoy, and relax at the beautiful Lili'uokalani Gardens in Hilo on the Big Island of Hawai'i. 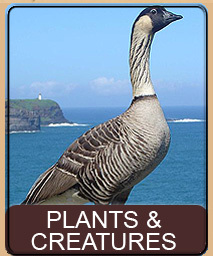 This page is named 'Parks.lgarden'. Can't Find It?